Dr. Sa'adiah Munir is a Lecturer with the School of Business. 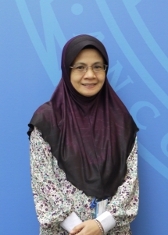 She joined Monash University Sunway campus in 2011. Her principal research interest is in Corporate Governance, Family Business and Earnings Quality. Munir, S., Mohd-Saleh, N., Jaffar R. and Yatim, P. (2013). Related Party Transactions, Family Ownership and Earnings Quality: A Study of Malaysian Firms. Asian Academy of Management Journal of Accounting and Finance 9(1), 1-20.